Contemporary atrium-style high-rise set in Walt Disney World Resort. Located near Disneyworld, the hotel offers free transportation to all 4 theme parks and features an outdoor pool. The hotel features 1 and 2 bedroom condominiums, 2 outdoor pools, a game room, lazy river, and miniature golf. An African-lodge style resort with free-roaming wildlife on its preserve; sister to the Jambo lodge. This Deluxe Villa Resort features a beach and a pool, inlcuding a unique water slide wrapped in a glass block. Located less than a mile from Disney World theme parks, the resort has furnished villas, tennis court and outdoor pool. 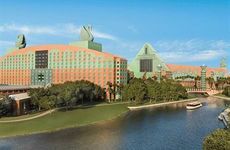 This hotel is conveniently located within the Walt Disney World Resort.